2010 census • Group's population grew 78% in 10 years; it's now 13% of state's total. 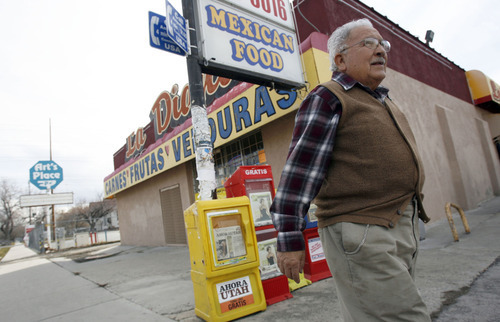 Francisco Kjolseth | The Salt Lake Tribune Archie Archuleta, who has lived in Utah for 50 years, walks one of his West side neighborhoods where he has noticed an explosion of Hispanics in the past 10 years, with many more businesses now catering to them. Utah's Latino population soared by 78 percent during the past decade  growing by nearly 157,000 people to 358,000 total. That is about twice the size of Salt Lake City, according to long-awaited 2010 census data released Thursday. In fact, the head count , taken once every 10 years, indicates that three of every 10 new Utahns who arrived by birth or immigration during the decade were Latino  and four of every 10 were minorities. Overall, Latinos now make up 13 percent of the state's population. 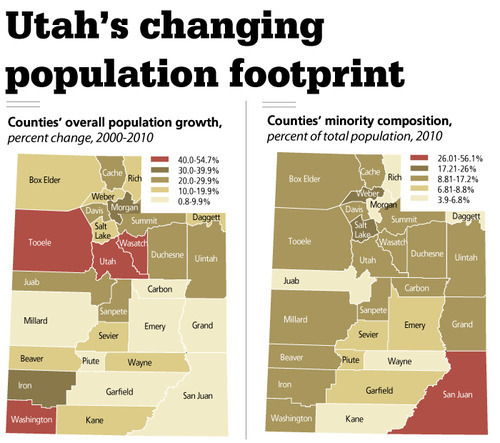 "That is changing the face of Utah, so that now, one of every five Utahns [19.6 percent] are minorities," said University of Utah research economist Pam Perlich. "One of every four Utah children are also minorities, so the difference is even greater among youth." Archie Archuleta has watched how that has changed his Glendale neighborhood in west Salt Lake City, where he has lived for 50 years. "It went from 90 percent white and LDS to about 50 percent in just the last 10 years," said Archuleta, who is president of the Utah Coalition of La Raza. "Schools on the west side have become almost [an] Anglo minority, with the biggest percentage of the minorities being Latino." He related how many stores there have converted their names and products to target Latinos. "The owners are Anglo, but they saw immediately the change that came in the area and quickly adapted." He talks of how even regional chain grocery stores, such as Smith's, added Spanish signs and Spanish-speaking staff. Archuleta says churches started offering more meetings and social services in Spanish. "Most of that really has happened here recently," he said, "in just the last 10 or 15 years." New data indicate that Salt Lake City is 22 percent Latino overall  but, of course, that figure is higher in some neighborhoods such as Glendale. Minority populations have grown so much that some Utah cities are now "minority majority," or nearly so. Wendover, for example, is 71.4 percent minority, mostly because of Latinos drawn there for work in casinos in adjacent West Wendover, Nev. Hideout, a town in Wasatch County, is 78.7 percent minority. Among larger cities and areas, West Valley City is 45 percent minority (33 percent Latino); South Salt Lake is 42.1 percent (29 percent Latino); Kearns is 40.4 percent (33 percent Latino); and Ogden is 35.3 percent (30 percent Latino). Data also indicate that 24 percent of all Utah children are minorities  and 17 percent are Latino. The 2010 census asked no questions to identify how many Utah residents are undocumented. However, the Pew Hispanic Trust, using earlier polling data by the U.S. Census Bureau, estimates that 110,000 undocumented people live in Utah  up from 65,000 in 2000 (a 69 percent increase), but down from 120,000 in 2007, when the recession hit. The Latino increase has led some Utah lawmakers this year to propose legislation they say is needed to stop what they see as a flood of illegal immigrants  making that the hot topic of the current session of the Legislature. At least 17 bills and resolutions have been offered this year to deal with illegal immigration. State demographer Juliette Tennert said a main reason behind Latino growth is that Utah's economy was stronger than those of most states early in the past decade, so it attracted more job-seeking Latinos and others. "Besides that, Latinos have a high birthrate," she said. "While all Utah women have high birthrates, the rate for Latinos is even higher," so that added to their numbers once they settled here. Perlich said about 70 percent of Utah's growth during the decade came from "natural increase," thanks to Utah's highest-in-the-nation birthrate. She said the other 30 percent came from in-migration from other states and nations, mostly during the early part of the decade. The 78 percent spurt by Latinos between 2000 and 2010 was three times faster than Utah's overall growth  and the state's growth was rapid. The state's population grew by 23.8 percent  more than a half-million people  to a total of 2,763,885, making it the third-fastest-growing state behind Nevada and Arizona. Latino growth was actually faster, by percentage, between 1990 and 2000, when it swelled by 138 percent to 201,559. By sheer numbers, however, the growth was greater between 2000 and 2010. Growth during the past decade by minority groups in Utah besides Latinos was also much more rapid than among whites, but they make up a much smaller portion of the population. Utah's black population grew by 66 percent to 29,287 (about 1 percent of the state total). Pacific Islanders grew by 62 percent to 24,554 (about 1 percent of the total). Asians grew by 49 percent to 55,285 (about 2 percent of the total). American Indians grew by 10.9 percent to 32,927 (or 1.2 percent of the total). Non-Latino whites grew by 16.7 percent to a total of 2.2 million, or 80 percent of the population. Of note, demographers have often said that Latino populations may be underrepresented due to fear in responding to the census. However, Perlich said, the Utah Latino population in the new count is actually higher than previously estimated, while Utah's overall tally is a bit less than earlier estimated. The Census Bureau has been releasing detailed data for a few states each week during February, and Thursday was Utah's turn. The numbers were released specifically to help lawmakers draw new political boundaries. However, legislators say they don't plan to work on redistricting until after the current session of the Legislature is completed. "It starts in April and will go all summer long," said Senate President Michael Waddoups, R-Taylorsville, of planned hearings and efforts to redraw boundaries. Because of growth, Utah has earned a fourth U.S. House seat. Lawmakers must decide how to split the state among four districts instead of three. They must also redraw boundaries for the 29 state Senate seats and the 75 state House seats. Cities and counties will also use the data to redraw their districts.